North Pryor Cove is shown in this file photo. JASPER, Tenn. — City leaders say Jasper has received more than half a million dollars in grant money for a sewer expansion in the North Pryor Cove area of town. The U.S. Department of Housing and Urban Development Community Development Block Grant awarded Jasper $525,000 to help complete the estimated $708,000 project. "We applied for this over a year ago, and we have applied for this grant several times to make some improvements to the sewer system," Mayor Paul Evans said Monday. "We got turned down each time." The sewer will be expanded to Georgia Lane, Gail Lane and "portions" of Marilyn Drive, officials said. "We were having problems with septic systems in Pryor Cove," Evans said. "It'll be a [conventional] gravity [sewer line] and will tie in down there on North Pryor Cove Road." The community development block grant doesn't require matching money from the city, but it doesn't cover engineering services for a project of this sort, though Evans said the grant sets "sort of a limit" that engineers can charge. "All of them are like that," said Gary Cosby, an engineer with CTI Engineers Inc., in Chattanooga. "All CDBGs are like that. Our fees are pretty much fixed by [the grant's] process." At its October meeting, the Jasper Board of Mayor and Aldermen voted unanimously to pay the $183,000 cost of engineering services performed by CTI Engineers. 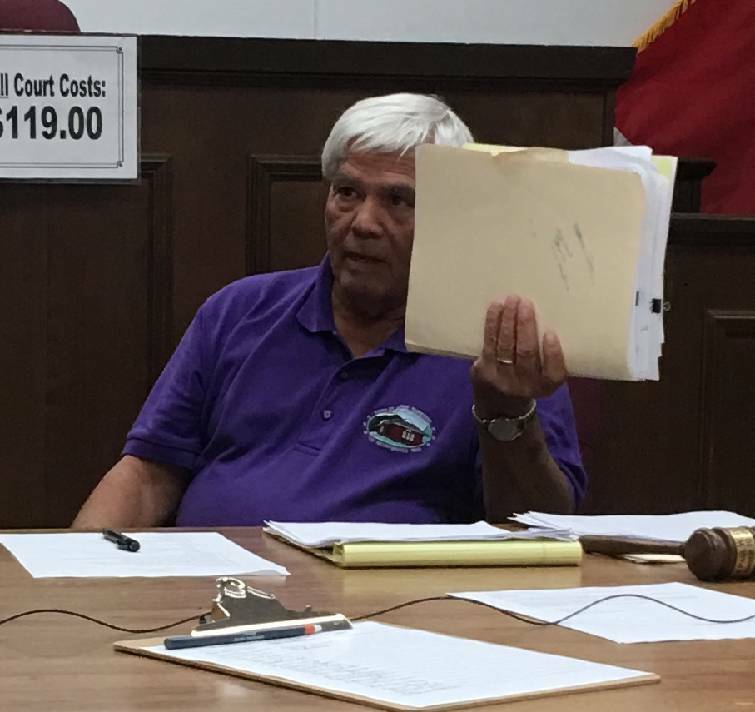 Jasper, Tenn., Mayor Paul Evans displays a folder full of certified letters that he says he's sent out to landowners trying to get them to clean up their properties. In other business, the board voted unanimously to table the renewal of two rental contracts with cell tower site provider American Tower Corp. in Boston, Mass. Acting on a recommendation from City Attorney Mark Raines, the board voted to have Vertical Consultants in College Grove, Tenn., examine the deal in an effort to get the maximum amount of money possible. "I've used them in my personal capacity on one of the cell towers that's on my property," Raines told the board. "I'd like [Vertical Consultants] to take a look at that. There may be more money there than what American Towers is offering on this." Evans said the city owns the property where two cell towers have been constructed and rents both to American Towers. The company notified him recently that both rental contracts are within five years of expiration. "Which is good for us as a town," Raines said. "That means they're getting antsy about it." He said Vertical Consultants will examine the contracts but the board would have to approve any proposed agreement. "I think it would be worth the town's while to have this company take a look at that and see if that's a fair price or if there may be some more revenue out there that the town could get on both these contracts." Ryan Lewis is based in Marion County. Contact him at ryanlewis34 @gmail.com.